I’ve long been interested in disaster resilience particularly when considered through the lens of self-organization. To be sure, the capacity to self-organize is an important feature of resilient societies. So what facilitates self-organization? There are several factors, of course, but the two I’m most interested in are social capital and communication technologies. My interest in disaster resilience also explains why one of our Social Innovation Tracks at QCRI is specifically focused on resilience. So I’m always on the lookout for new research on resilience. The purpose of this blog post is to summarize the latest insights. 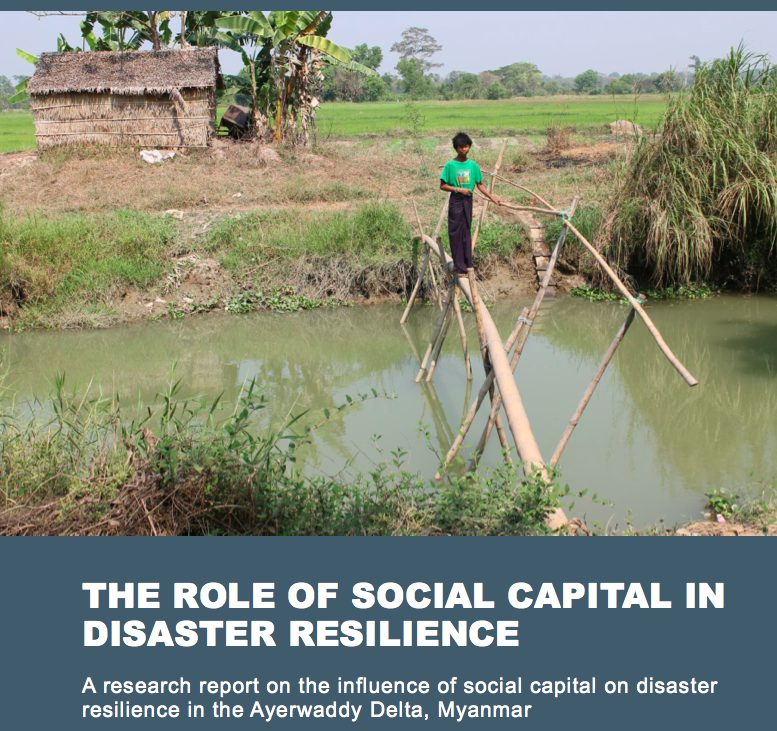 This new report (PDF) on Burma assesses the influence of social capital on disaster resilience. More specifically, the report focuses on the influence of bonding, bridging and linking social capital on disaster resilience in remote rural communities in the Ayerwaddy Region of Myanmar. Bonding capital refers to ties that are shared between individuals with common characteristics characteristics such as religion or ethnicity. Bridging capital relates to ties that connect individuals with those outside their immediate communities. These ties could be the result of shared geographical space, for example. Linking capital refers to vertical links between a community and individuals or groups outside said community. The relationship between a village and the government or a donor and recipients, for example. Meanwhile, in San Francisco, a low-income neighborhood is building a culture of disaster preparedness founded on social capital. “No one had to die [during Hurricane Katrina]. No one had to even lose their home. It was all a cascading series of really bad decisions, bad planning, and corrupted social capital,” says Homsey, San Francisco’s director of neighborhood resiliency who spearheads the city’s Neighborhood Empowerment Network (NEN). The Network takes a different approach to disaster preparedness—it is reflective, not prescriptive. The group also works to “strengthen the relationships between governments and the community, nonprofits and other agencies [linking capital]. They make sure those relationships are full of trust and reciprocity between those that want to help and those that need help.” In short, they act as a local Match.com for disaster preparedness and response. Their early work has focused on “making plans to protect the neighborhood’s most vulnerable residents: its seniors and the disabled.” Many of these residents have thus received “kits that include a sealable plastic bag to stock with prescription medication, cash, phone numbers for family and friends. 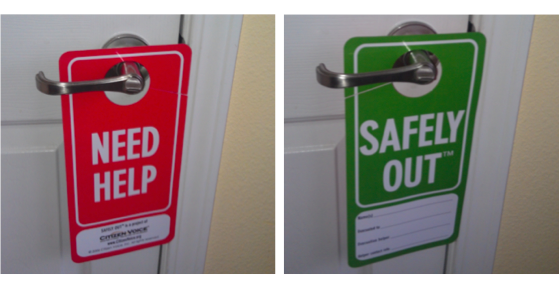 They also have door-hangers to help speed up search-and-rescue efforts (above pics). Lastly, colleagues at the Rockefeller Foundation have just released their long-awaited City Resilience Framework after several months of extensive fieldwork, research and workshops in six cities: Cali, Columbia; Concepción, Chile; New Orleans, USA; Cape Town, South Africa; Surat, India; and Semarang, Indonesia. “The primary purpose of the fieldwork was to understand what contributes to resilience in cities, and how resilience is understood from the perspective of different city stakeholder groups in different contexts. 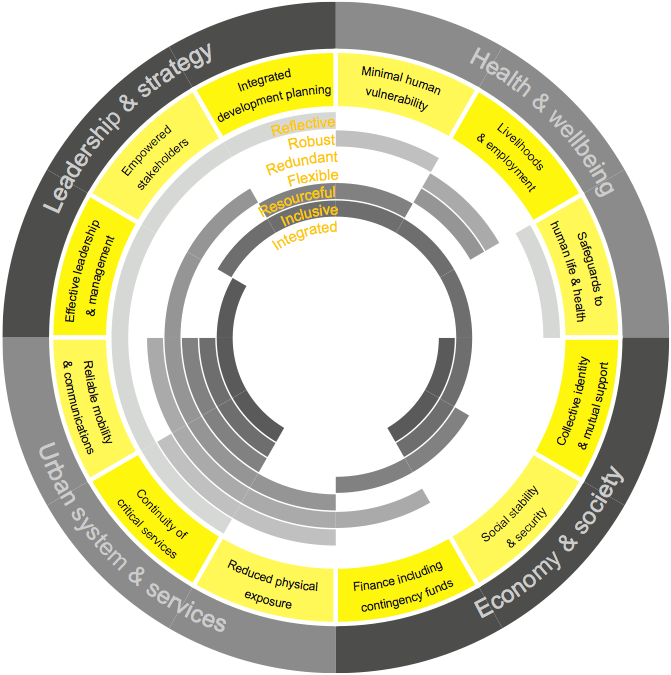 The results are depicted in the graphic below, which figures the 12 categories identified by Rockefeller and team (in yellow). Collective identity and mutual support: this is observed as active community engagement, strong social networks and social integration. Sub-indicators include community and civic participation, social relationships and networks, local identity and culture and integrated communities. Empowered stakeholders: this is underpinned by education for all, and relies on access to up-to-date information and knowledge to enable people and organizations to take appropriate action. Sub-indicators include risk monitoring & alerts and communication between government & citizens. Reliable communications and mobility: this is enabled by diverse and affordable multi-modal transport systems and information and communication technology (ICT) networks, and contingency planning. Sub-indicators include emergency communication services. Effective leadership and management: this relates to government, business and civil society and is recognizable in trusted individuals, multi-stakeholder consultation, and evidence-based decision-making. Sub-indicators include emergency capacity and coordination. How am I interested in observing these drivers of resilience? Via social media. Why? Because that source of information is 1) available in real-time; 2) enables two-way communication; and 3) remains largely unexplored vis-a-vis disaster resilience. Whether or not social media can be used as a reliable proxy to measure resilience is still very much a research question at this point—meaning more research is required to determine whether social media can indeed serve as a proxy for city resilience. As noted above, one of our Social Innovation research tracks at QCRI is on resilience. So we’re currently reviewing the list of 32 cities that the Rockefeller Foundation’s 100 Resilient Cities project is partnering with to identify which have a relatively large social media footprint. We’ll then select three cities and begin to explore whether collective identity and mutual support can be captured via the social media activity in each city. In other words, we’ll be applying data science & advanced computing—specifically computational social science—to explore whether digital data can shed light on city resilience. Ultimately, we hope our research will support the Rockefeller Foundation’s next phase in their 100 Resilient Cities project: the development of a Resilient City Index. The Rockefeller Foundation recently launched a major international initiative called “100 Resilient Cities.” The motivation behind this global project stems from the recognition that cities are facing increasing stresses driven by the unprecedented pace urbanization. More than 75% of people expected to live in cities by 2050. The Foundation is thus rightly concerned: “As natural and man-made shocks and stresses grow in frequency, impact and scale, with the ability to ripple across systems and geographies, cities are largely unprepared to respond to, withstand, and bounce back from disasters” (1). Resilience is the capacity to self-organize, and smart self-organization requires social capital and robust feedback loops. I’ve discussed these issues and related linkages at lengths in the posts listed below and so shan’t repeat myself here. Instead, I want to make a case for community-driven “tactical resilience” aided (not controlled) by data science. I came across the term “tactical urbanism” whilst at the “The City Resilient” conference co-organized by PopTech & Rockefeller in June. Tactical urbanism refers to small and temporary projects that demonstrate what could be. We also need people-centered tactical resilience initiatives to show small-scale resilience in action and demonstrate what these could mean at scale. Data science can play an important role in formulating and implementing tactical resilience interventions and in demonstrating their resulting impact at various scales. Ultimately, if tactical resilience projects do not increase local capacity for smart and scalable self-organization, then they may not render cities more resilient. “Smart Cities” should mean “Resilient Neighborhoods” but the former concept takes a mostly top-down approach focused on the physical layer while the latter recognizes the importance of social capital and self-organization at the neighborhood level. “Indeed, neighborhoods have an impact on a surprisingly wide variety of outcomes, including child health, high-school graduation, teen births, adult mortality, social disorder and even IQ scores” (1). So just like IBM is driving the data science behind their Smart Cities initiatives, I believe Rockefeller’s 100 Resilient Cities grantees would benefit from similar data science support and expertise but at the tactical and neighborhood level. This explains why my team and I plan to launch a Data Science for Resilience Program at the Qatar Foundation’s Computing Research Institute (QCRI). This program will focus on providing data science support to promising “tactical resilience” projects related to Rockefeller’s 100 Resilient Cities initiative. The initial springboard for these conversations will be the PopTech & Rockefeller Fellows Program on “Community Resilience Through Big Data and Technology”. I’m really honored and excited to have been selected as one of the PopTech and Rockefeller Fellows to explore the intersections of Big Data, Technology and Resilience. As mentioned to the organizers, one of my objectives during this two-week brainstorming session is to produce a joint set of “tactical resilience” project proposals with well articulated research questions. My plan is to select the strongest questions and make them the basis for our initial data science for resilience research at QCRI.